2012 has been a great year for me. I expanded my plugin development business, I started a large community-driven plugin project, I contributed to WordPress core and plugins that were not mine, and my wife and I started a family by bringing our first baby girl into the world. This site has seen very steady growth since it’s launch a little over a year ago (October, 2011) and I’m quite happy with the numbers. 207,841 different people visited the site in 2012, with 307,889 visits total. There were 630,599 page views and an average of just over 2 page views per visit. Nearly 33% of the site visitors were returning visitors (I think that’s good). The most visited posts / pages on the site were nearly all detail pages for some of my more popular plugins (no surprise there), with Easy Content Types being the most popular, and Restrict Content Pro taking second place. My primary goal for 2013 will be to pass 1 million page views on the site in a single year (2012 had about 640,000). In 2012, I published 169 new posts, which is 69 more than I published in 2011. Exactly one year ago, I launched my membership section to this site. Paid members gain access to restricted tutorials and also free downloads of several plugins offered exclusively through the site. Last April I launched a large plugin project called Easy Digital Downloads, which is an e-commerce plugin specifically for selling digital products. The plugin has really taken off and has seen a large amount of growth over the last nine months and I’m exceptionally pleased with where the plugin is today. EDD has been downloaded 41,888 times from the WordPress.org repository. The plugin has 5 official contributors: mordauk (me), sksmatt, sunnyratilal, SpencerFinnell, Chriscct7. 40 developers have contributed patches to the EDD. Easy Digital Downloads has received 62 5-star ratings and 17 reviews (all 5-star). There are currently 63 published extensions for EDD, with many more in the development / planning stages. $24,624.20 has been made in extension sales since April, 2012. Easy Digital Downloads has also succeeded in hiring three paid support staff to help with the ever-growing support ticket numbers. I really couldn’t be happier with how well Easy Digital Downloads has been doing. My commercial plugins include all of those sold through Code Canyon.net, Mojo Code, and this site. Commercial plugin sales account for a very significant part of my annual income (it’s more than enough to support my family) and today has been a good year. My most valuable plugin is Easy Content Types, with the runner up being Restrict Content Pro. Eliza Joy Williamson was born May 10, 2012. Pippin, thanks for sharing your success in such an informative way and for all your contributions to the WordPress community—I value my premium membership and really appreciate the thoughtfulness and depth of your tutorials and posts. Congratulations on your 2012 success, your beautiful daughter and best wishes for a wonderful 2013! Well done Pippin! Great numbers indeed 🙂 Thanks for sharing, as always. My god! Congratulations Pippin and thanks for everything. You are an awesome dude! Many more awesomeness in the year 2013. All the best Pippins! 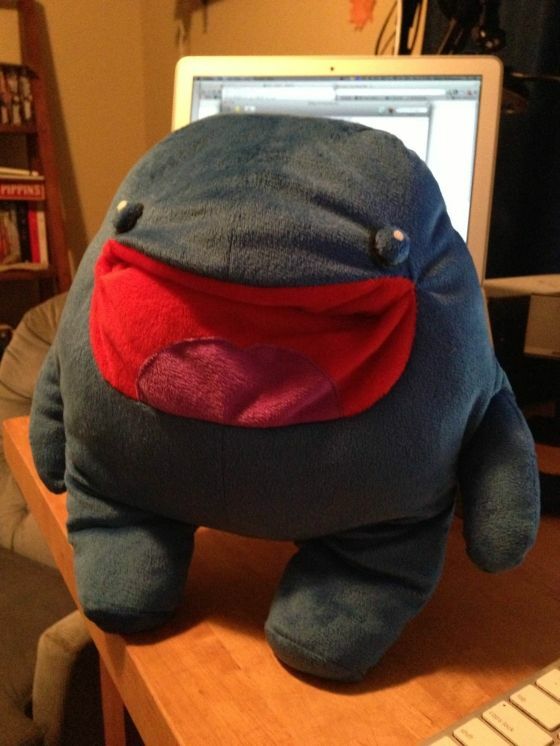 You know you’ve hit the big time when you make your first plushy. Keep up the great work Pippin! congrats man! what a great year! Thanks for your great works and ideas. Pippin, I love the openness and the earnings reports. It’s awesome to see how diversified your business is becoming, and how well you are doing for yourself. Nice work, and keep it up! You make great products, and I can’t wait to see your business grow more in 2013. Congrats on a successful year in 2012. I myself started full time freelancing / startup my own consulting company, and have had similar successes. I’m getting into plugin development in the coming year and will be frequenting your site. Great job on a year well done, and a daughter. Underneath this jealous sky you deserve nothing but even greater year 2013! Hi from a fellow CodeCanyon developer. Amazing stats you have shared here. Good luck to you coming 2013. Congrats man! One day, I may make the jump into full time as well. Ha! Congrats on the new-born and the amazing year. You’ve done an wonderful job and EDD is a fantastic plugin – it’s great to see quite a few designers & developers get on-board and I’m looking forward to seeing what 2013 has to offer. Here’s to the new year and I’ll be watching for the follow up post at the end of the year showing what’s happened, what’s changed, and that you’ve doubled your income :-). Pippin, just discovered you today. What a great year! From the looks of what I have seen – you deserve it. Very professional, impressive, and all this from a truly nice guy. Great numbers Pippin, you deserve all this, keep up the impressive work and thanks for being so open! This will surely serve as inspiration to many others. Great to see the success of your business. Your plugins are top notch. So happy to see a true entrepreneur like yourself making an honest living from WordPress development! And thanks for being so transparent with your numbers, it’s quite motivating and inspiring to read. Congrats about your daughter! Sorry I am late, didn’t know this. They are awesome. My daughter just turned 3. It is a wonderful experience.